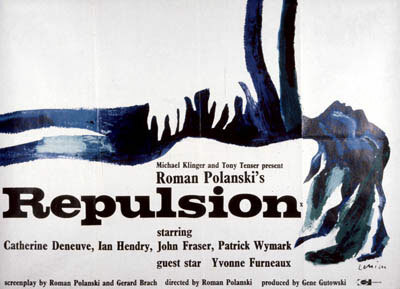 Bleak, dark, haunting - not words you would obviously associate with Catherine Deneuve and 60s London, but words you would associate with Repulsion. Roman Polanski's second film (but his first English language) is a tale of mental breakdown - as good as anything on the subject. Deneuve is Carol Ledoux - on the face of it an attractive but shy beautician, living in London with her sister. But underneath a repressed and lonely Belgian girl with a fear of men - getting lonelier by the day as her sister Helen (Yvonne Furneaux) spends most of her evenings with her married boyfriend Michael (Ian Hendry). Carol just about holds onto her sanity through her mundane job and her sister's support - but when Helen leaves for an Italian holiday, Carol is left alone with her fears, falling into a depression and extreme breakdown with murderous consequences for both a potential boyfriend and the landlord. Dialogue is minimal - but the images (expertly aided by cinematographer Gilbert Taylor) tell you everything. From the cracks in the walls and pavement (representing the cracks in Carol's mental state), the hallucinatory grabbing hands, the rotting food and brutal slayings - all leave a deep impression and create one of the most disturbing worlds ever caught on film. A masterclass in how to use a soundtrack sparingly too, courtesy of jazz man Chico Hamilton. Not exactly light viewing, but if you want a masterclass in how to make a psychological thriller, it's right here. And at under £4 at Amazon, a steal too.